Honua Kai is one of the most luxurious family-friendly resorts in West Maui. Granite countertops, top-of-the-line appliances, and a spacious living area. With a waterslide, kiddy pool, four hot tubs, and a quiet lap pool, there's plenty for all ages. On the quieter north end of Ka'anapali, you'll have room to spread out and watch the kids. One of Hawaii's most popular restaurants is on-site, and on the water's edge. Take a break from eating out. Grab groceries downstairs and fire up your kitchen. You have direct access to Ka'anapali Beach. A kids pool, water park, and playground are great for the little ones. Get a massage or dine on the ocean. It's a great place for a honeymoon or romantic getaway. The thirty-eight-acre Honua Kai Resort & Spa is a high-end luxury resort that has been bringing a new level of comfort to the island since 2009. Don’t bother unpacking once you get to your condo, just get changed into swimsuits and get ready to hit the pools. The Honua Kai resort pool area has three pools plus a children’s pool. The area includes water slides, waterfalls, grottos, shallow ledges for the kids and adults-only areas for the grown-ups. Go for a swim or relax poolside and catch up on celebrity gossip from the latest issue of US Weekly. When it’s time for lunch, fire up the poolside Honua Kai bbq grills. Let the little ones help carry burgers, hot dogs and sides and get ready for a fun family cookout. The resort has on-site childcare available, perfect for a grownups-only night out or a day at the on-site Ho’ola Spa. With Honua Kai Spa services, you can unwind with a facial, massage or body treatment. Studio condos sleep four guests and offer ocean or partial ocean views. One- to two-bedroom condos sleep four to six guests and have resort, partial ocean, ocean and mountain views (one-bedroom only). Three-bedroom condos sleep eight guests and offer ocean and oceanfront views. Full gourmet kitchens with Bosch Appliances have everything that you need to whip up anything from sandwiches to multi-course meals. Visit the on-site gourmet market for groceries. Surprise the kids with top-your-own pizza night and let them go wild. Declare the pizza with the most unusual toppings the winner and put the pizza artist in charge of the remote. Or take a night off from cooking and dine at one of the two on-site restaurants. Flatscreen TVs with Cable and DVD players are perfect for catching a sitcom rerun or for family movie night. Your Honua Kai Resort rental is just a short walk to Kaanapali Beach. It was once named America’s best beach. It offers three miles of sparkling white sand and crystal clear water. Work on your sun kissed look while the kids build sandcastles or look for seashells. Whalers Village is an outdoor shopping mall in Kaanapali Beach. Stores include Tommy Bahama, Alex and Ani, Louis Vuitton, Quiksilver and Sephora. Get your caffeine fix at Island Vintage Coffee and surprise the kids with a visit to Häagen-Dazs. Up for a game of golf? Grab your clubs and go to Kapalua Golf Club Plantation Course. It’s the #1 golf course in Hawaii and was designed by Ben Crenshaw and Bill Coore. It’s a 7,411-yard par three course. Maui Paddle Sports offers canoe tours on authentic Hawaiian racing canoes. Tiny Bubbles Scuba has received a TripAdvisor Certificate of Excellence four years in a row. They offer scuba and snorkel lessons, guided shore tours and scuba diving certifications. Explore the island by renting a moped, motorcycle or sports car at Aloha Motorsports. - Site work of Luana Garden Villas at Honua Kai is expected to begin in early March 2018 through the year 2020. Hours of development will be from Monday through Saturday from 9:00 AM – 5:00 PM. Light work only (no noise) will be deliberately maintained from 8:00 AM – 9:00 AM. During this time the remainder of the resort, pools, restaurants and all its amenities will still be available for guest enjoyment. Cribs (infant beds) are available for USD 8 per night. Cancellations: All reservations are considered guaranteed once the resort has provided a confirmation number. A cancellation number must be obtained for any cancellation to be valid. All reservations must be cancelled twenty-one (21) days prior to arrival. Cancellations within twenty-one (21) days of arrival will be charged two (2) nights stay and tax of 4.166%. December 21, 2018 to January 06, 2019 -cancellations after November 1 will result in full forfeiture of room and tax for the entire stay. Early check outs (ECO): A minimum charge of two (2) nights' stay plus taxes will apply for all the reservations with the exception of reservations booked for less than two (2) nights. For stays December 21, 2018 - January 06, 2019 full forfeiture of room and tax for the entire stay will apply. Early Check-in/Late check outs: Requests for an early check in or late check out must be approved by the resorts office and shall be honored based on availability no sooner than 24 hours prior to arrival/departure. Additional fees will apply and will be paid locally by the guest upon checkout and automatically added to the final bill, unless notified otherwise, and subject to change at any time. The Aloha Lounge is available for use in the Hokulani Building between the hours of 10:00 am - 8:00 pm for guest use. No-Shows. HK shall guarantee all reservations for late arrival (check-in after 4:00 pm) which allows guest to check in by 11:59 pm on the arrival day. If the guest has not arrival day. If the guest has not arrived by midnight A "NO SHOW" charge shall be assessed to Wholesaler. No shows will be charged for the full amount of the total length of the guest's stay plus state tax of 4.166%. 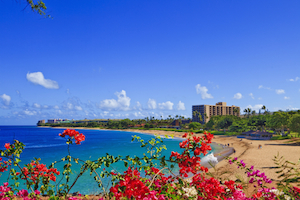 Ka'anapali is home to some of the most pristine beaches in Maui. Along three miles of golden sands, you'll find the action packed shopping area of Whalers Village, snorkeling at Black Rock Beach, and loads of other activities.